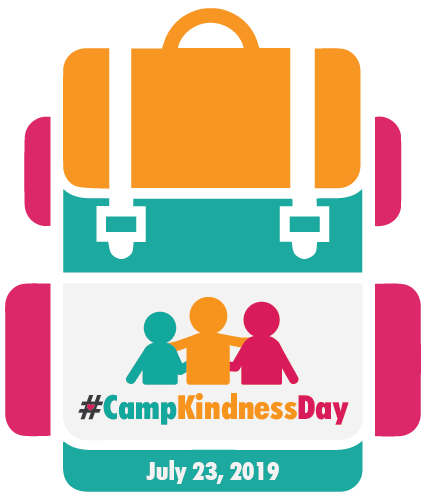 On July 23, the camp community will participate in Camp Kindness Day – an event highlighting the practice of intentional kindness that happens every day at American camps. This is our opportunity to demonstrate to the world the great work that camps are doing to teach kindness in engaging, simple, repeatable, and high impact ways that live on in the daily lives of campers and staff members when they return home. Focusing on our youth and young adults, Camp Kindness Day will help showcase the commitment of the camp community to fostering the core values of kindness, compassion, generosity and care, and integrating those values more fully into every aspect of our society. These values are already part of the fabric of the camp experience. We share the mission for our youth to be nurtured, taught, supported, and inspired to grow into our new generation of kind, compassionate, socially-minded, community-oriented citizens. Camp Kindness Day will allow camps to incorporate into their July 23 programming fun theme-based activities and cooperative games, cool projects, and memorable moments which will celebrate the value and impact of kindness. Schedule Camp Kindness Day into your programming on July 23. Help spread the word in a unified social media campaign by tagging #CampKindnessDay into your social media and other communications. Share your plans so that ACA can support you through localized public relations efforts. To support your camp’s involvement in Camp Kindness Day, ACA has produced an electronic #CampKindnessDay Backpack, complete with programming ideas and activities, FAQs, social media tips, and other information on how your camp can celebrate Camp Kindness Day. Be part of the nation-wide evolution! Plan now to add #CampKindnessDay to your camp’s programming on July 23.